I’ve always loved books and have bookcases in various rooms of my home: living room, sitting room, bedrooms, hall and kitchen. Three out of four of us in the family are avid readers and see books as possessions to be read, kept and treasured. I’ve recently been thinking of turning one of the rooms into a home library. While it’s lovely to have books in most of the rooms, it would be nice to have a room set up that is really conducive to reading, that is a room dedicated to books rather than being a room with a bookcase added into the mix. Whether you have the space (and the number of books) to devote a whole room to books or just a corner of a room, I hope you enjoy the inspiration provided by these photos. Libraries don’t have to be dark, almost mysterious places. They can also be light and airy with white shelves and contemporary seating. Libraries with darker woods tend to be more traditional. The ambience is of comfort with overstuffed armchairs, dim lighting accentuated by task lighting, and open fires, perhaps with an Irish coffee to hand. If planning a room like this, work out how many people are likely to use it at one time – does it just need two armchairs or will it require more seating? Place a lamp and side table beside the chairs for convenience and comfort. You can create a room within a room, a library within another room, in a way that you and other people know that it is a library, that it is a space devoted to books and to reading. The space under stairs is sometimes wasted space or it is closed off for storage. It could make a charming place for purpose built bookshelves. 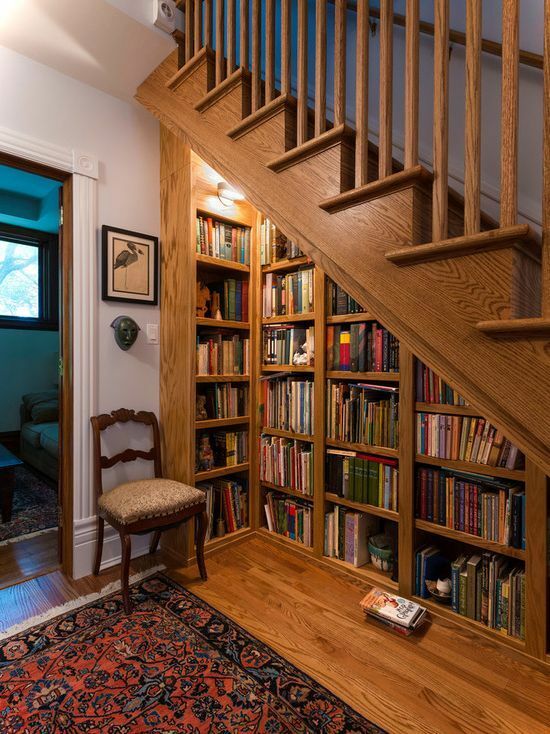 Ensure that the lighting is good, and if space permits, a comfortable armchair close to the stairs would make it look like a cosy reading nook too. 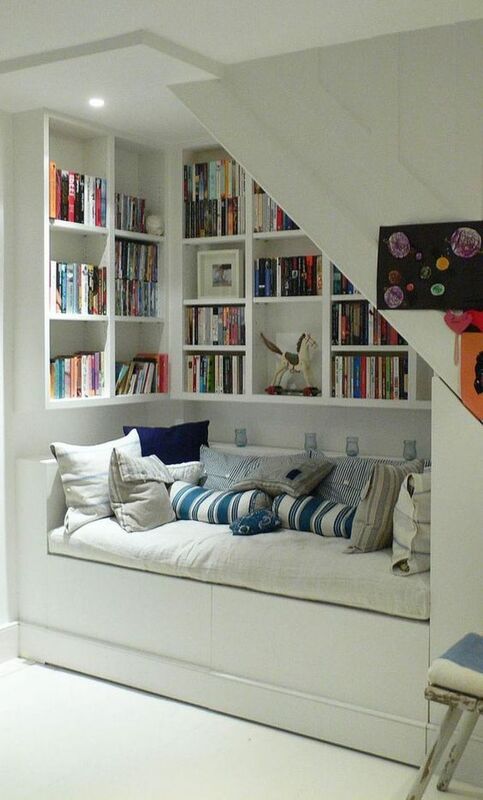 Alternatively, build the seating in under the stairs with the shelves starting from the top of the sofa. 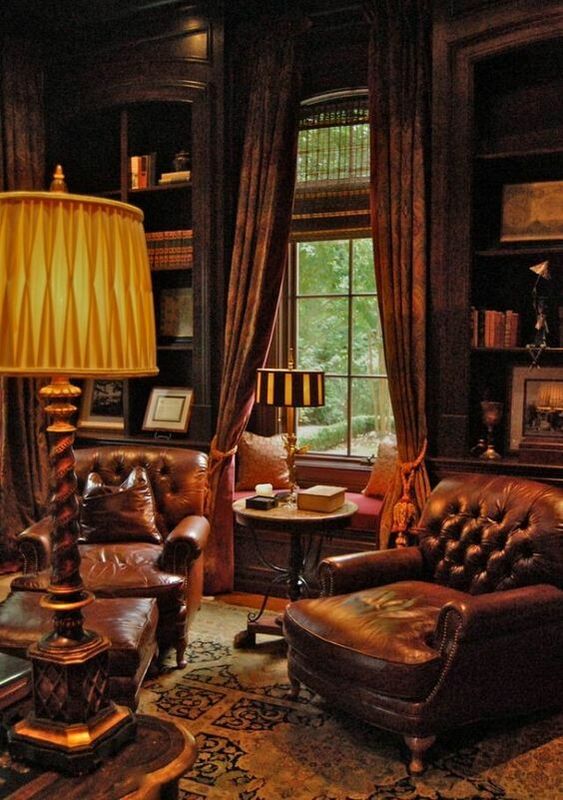 A deep bay window that is devoted to having a large comfortable seating area surrounded by books means that this is more than a reading nook, it is a library within another room. Mixing up the shapes of the shelves certainly adds interest as well as a different dynamic to the room. What about shelves like these diagonals? I think it looks great but I’m wondering if I’d find it annoying after a while having to look at books on the diagonal rather than a straight line. 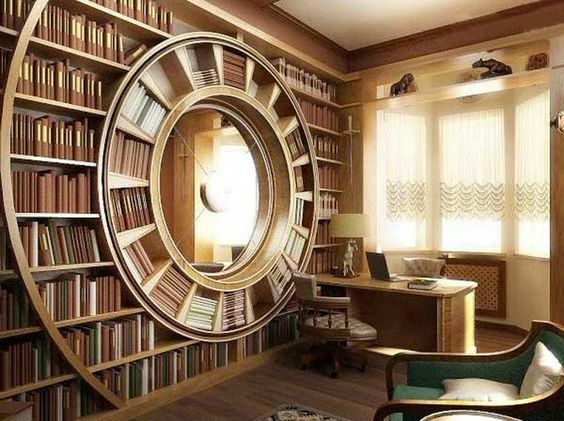 This large circle surrounding the mirror and accentuated by the curve to the left certainly removes the sense of any harsh lines even though most of the books are laid out on traditional straight bookshelves. 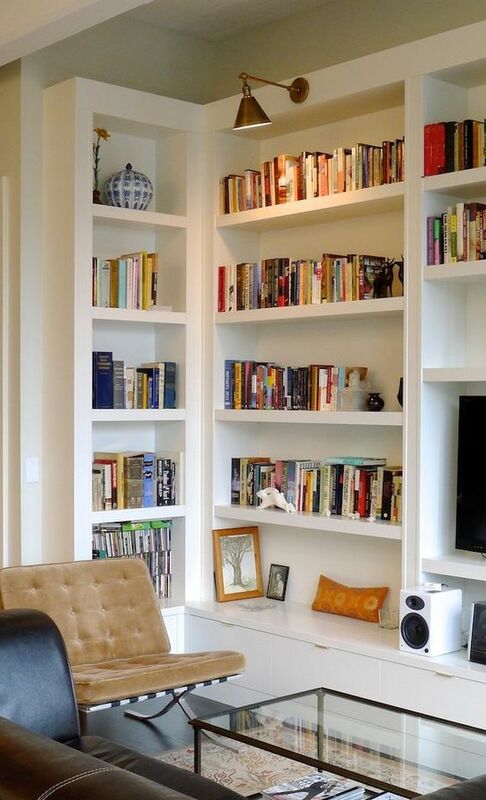 Another consideration is whether to opt for built-in or freestanding shelving for your books. 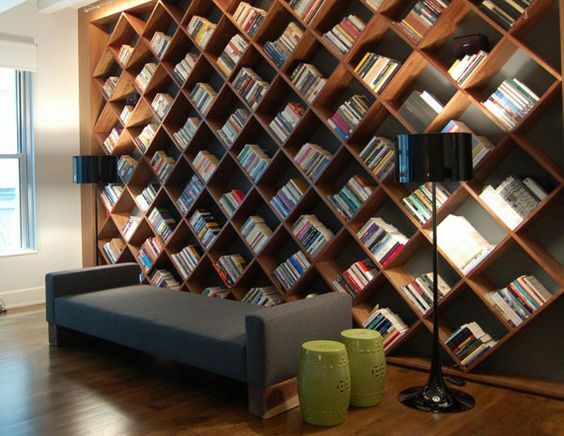 Built-in means it all looks uniform, it can stretch from floor to ceiling and you’ll fit more books in. As in this A-shaped space, built in shelves mean that books can be fitted into every inch of the space, even if the space is irregularly shaped. Free standing shelves have the advantage of being different, perhaps being quirky. 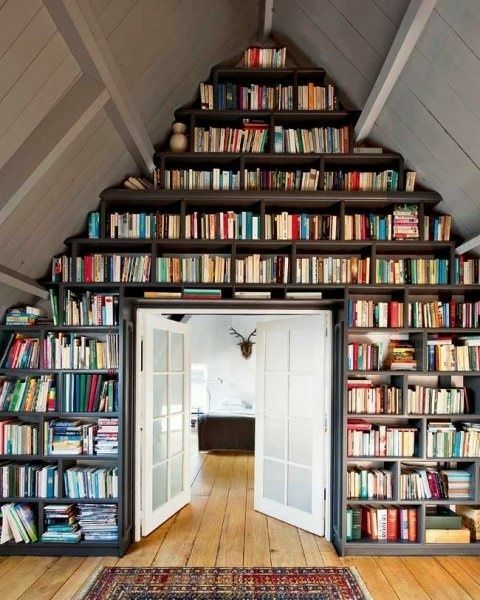 You can add to it as you get more books or can afford more storage and you can move the furniture around. 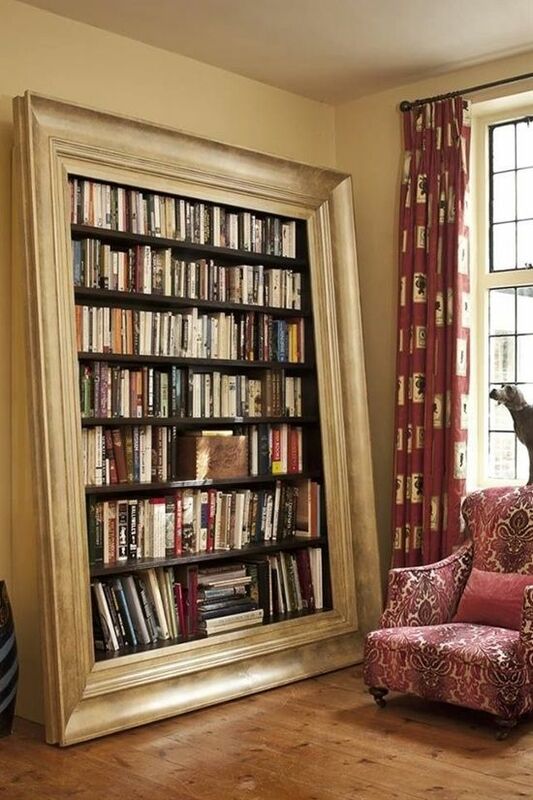 Is this a mirror reflecting the shelves on the opposite wall or is it a bookshelf? If you look closely, you’ll see it is the latter. 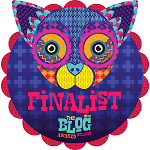 I think it’s wonderfully quirky. Shelves like these should always be fastened to the wall – just in case they topple over. 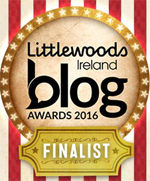 See a recent post: What do your bookshelves say about you? I hope this has given you some inspiration if you’re thinking creating a small library within a room or devoting a whole room to books. And remember, if you need a carpenter, electrician or a decorator, leave the details on our website and you’ll receive quotes from up to four rated tradesmen. 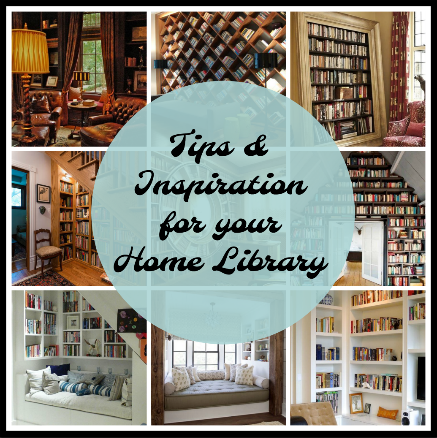 This entry was posted in Decorating, Decorating Tips, Design Ideas, Interior Design, Library and tagged bookcases, bookshelves, built-in shelves, creating a home library, home library, modern library, traditional library. Bookmark the permalink.